As you climb the steps to the Taiyuin Mausoleum, birds replace the sound of traffic. Only a few people walk by. You linger over the delicate carvings gracing the walls of the mountain temple. You feel removed from everything. It’s impossible to believe you’re only a two-hour train ride from Tokyo. Nikko is a popular day-trip from the capital, but “day-trip’”doesn’t come close to describing the place. Nikko stays with you long after you’ve left Japan. 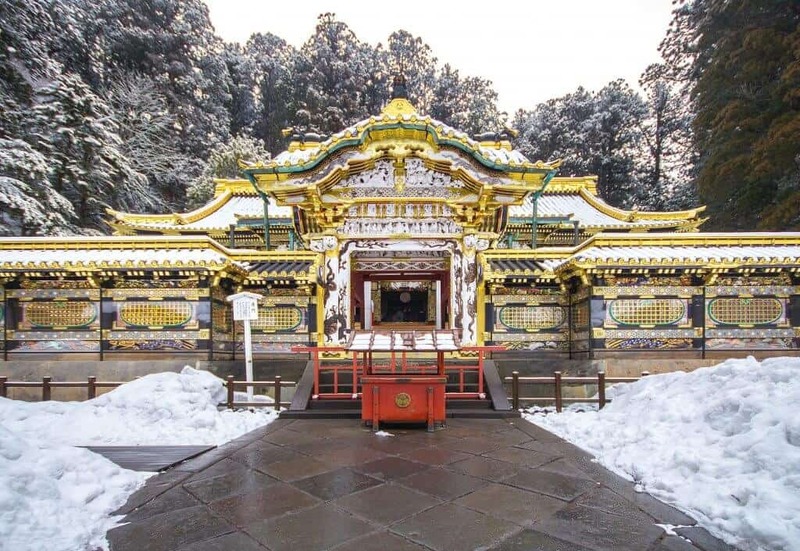 Nikko offers three magnificent mountain temples. 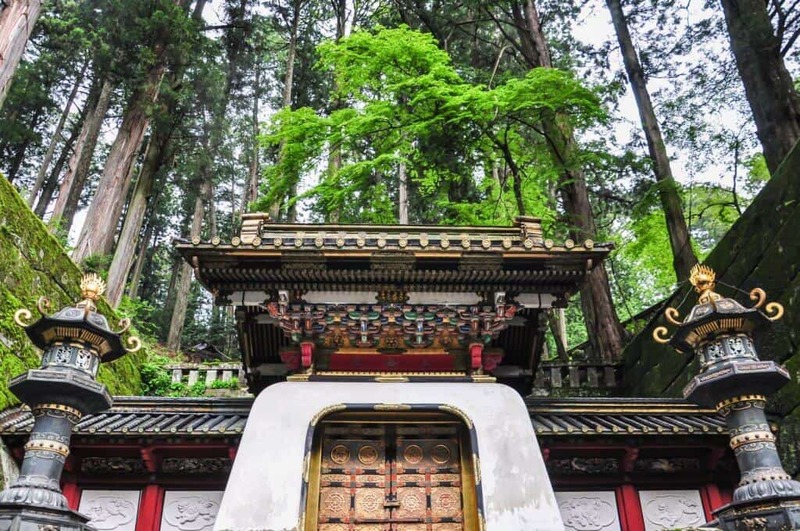 The temples: mighty Toshogu, serene Taiyu-in, and devoted Rinno-ji – sit amongst a gorgeous cedar and bamboo forest. Let’s begin with the mighty Toshogu. Nikko is known for temples. Toshogu is the first among them. Toshugo was built in 1617 as a mausoleum and temple devoted to Tokugawa Ieyasu. He was the first of the Tokugawa shoguns. The temple was rebuilt in 1636 by Ieyasu’s grandson, Iemitsu, the third shogun. The temple displays the power and wealth of the Tokugawa shogunate magnificently. The isolated location in the mountains kept the temple safe. Toshogu and the other temples in Nikko escaped the wars and fires that destroyed most of Tokyo’s temples. It’s popular with school groups. No matter when you visit, you’re almost guaranteed to run into one…. or three, or seven. Despite the crowds, it’s peaceful around the mausoleum. The bamboo forest surrounding the temple and mausoleum give the grounds an ethereal atmosphere. The colorful carvings are carefully preserved with frequent restoration work. You’ll likely recognize some things. 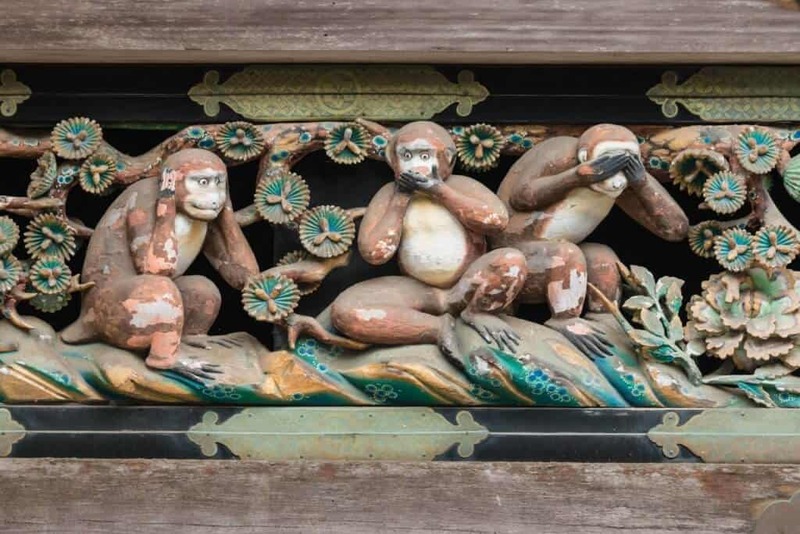 The three wise monkeys (of see-no-evil, hear-no-evil, speak-no-evil fame), illustrate Buddhist teachings. Some carvings are harder to identify. You may have trouble recognizing the elephant — the carver had only read about them! Master craftsman (and mystery man, as no one knows if he even existed) Hidari Jongoro carved the realistic sleeping cat. 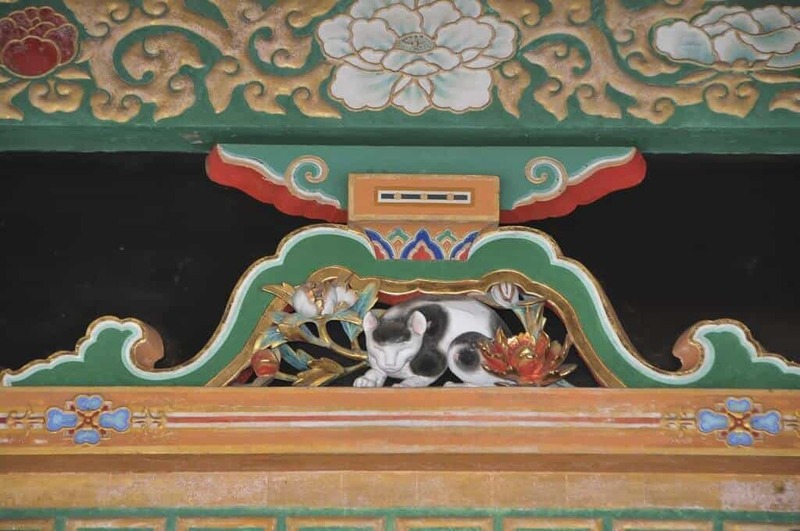 The cat sits in Toshogu’s east corridor. Legend has it the cat is so realistic mice never enter the temple. Be sure not to miss the Yakushi-do Hall. A monk stands ready to replicate the cry of the dragon painted on the ceiling with a special striking block. The stable houses a white horse donated to Toshogu by the government of New Zealand. 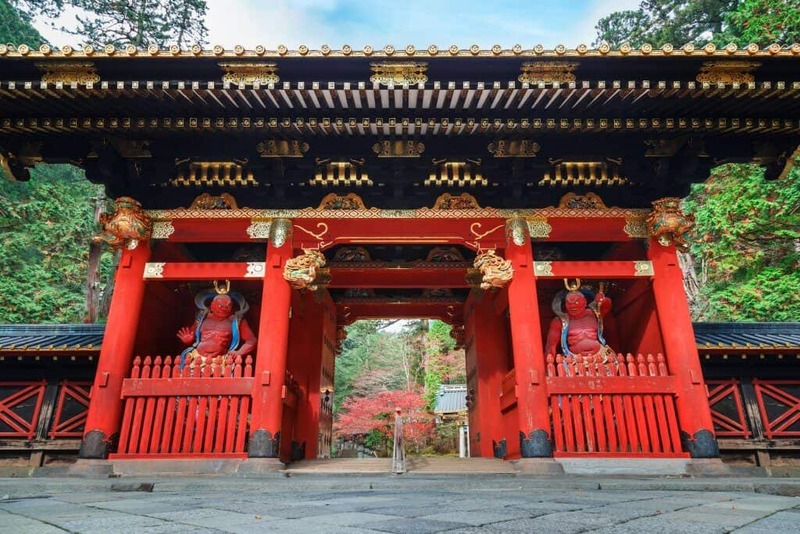 The Yomeimon Gate is considered one of the most beautiful gates in Japan. You’ll quickly see why. Tokugawa Iemitsu rests near his grandfather in a temple and mausoleum of his own. Taiyuin-byo is much smaller than Toshogu and not as elaborately decorated. It doesn’t draw the crowds Toshogu does, and for that reason, it has a greater feeling of serenity. Enjoy the beauty of the buildings. Listen to the wind moving through the surrounding bamboo. You can only view the main hall and mausoleum from the outside. Don’t miss the richly decorated Niomon Gate or the sculpture of the white dragon. Shodo Shonin came to Nikko in the 8th century to spread Buddhism. While here, he founded Rinno-ji. The temple attracted Tokugawa Ieyasu to Nikko. Throughout the Tokugawa era, each shogun made elaborate pilgrimages to Nikko. They stopped at Rinno-ji to pay their respects. Sanbutsu-do Hall is the highlight of Rinno-ji. The hall has three, 8-meter high statues of Buddhist manifestations. The golden-lacquered statues are impressive. Unfortunately, the exterior is undergoing restoration. It’s still worth a visit. A life-size reproduction of the temple adorns the huge scaffolding structure. The work will finish in 2019. 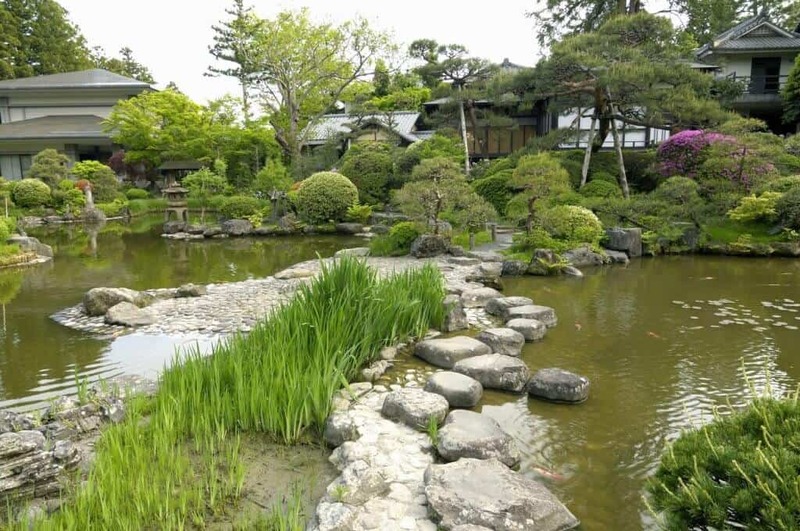 Rinno-ji is also known for Shoyo-en, the garden. Shoyo-en is famous for the fall colors of the maple trees in November. Shodo Shonin was a Buddhist monk. However, he founded Futarasan, which is a Shinto shrine. 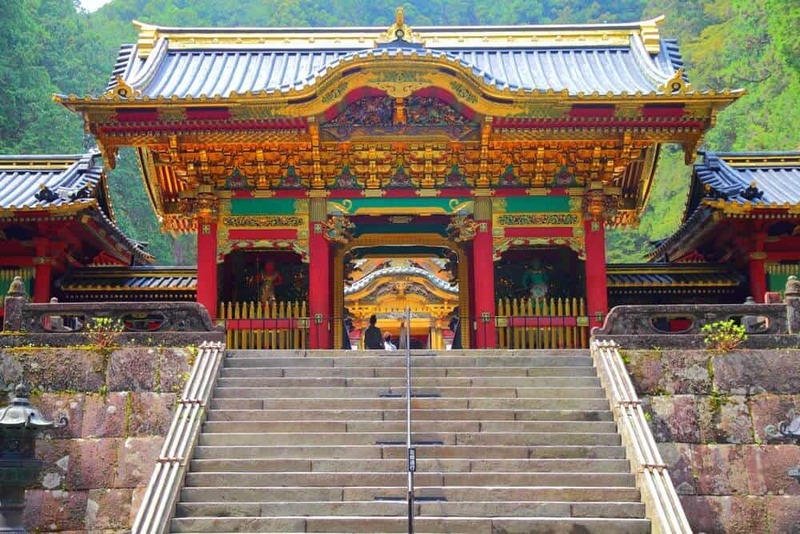 The shrine is dedicated to the three mountains surrounding Nikko. Some claim the three Buddha statues in Rinno-ji’s main hall represent these mountains — Mt. Nantai, Mt. Nyoho, and Mt. Taro. 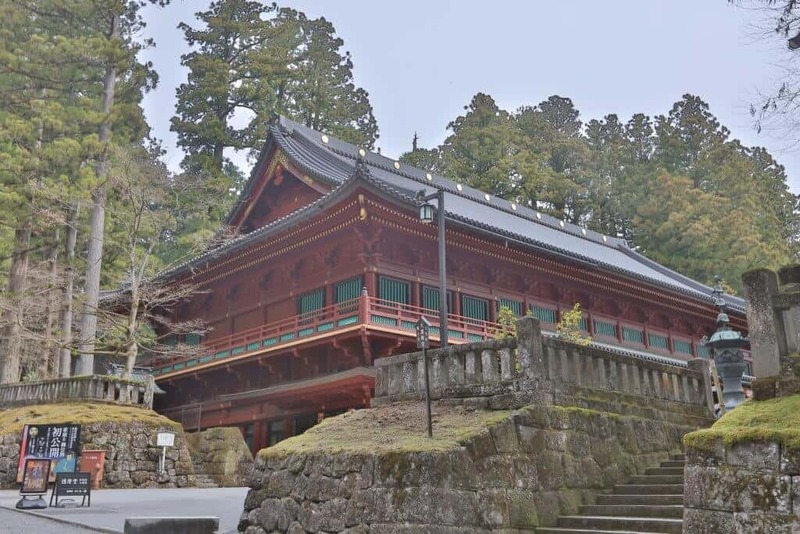 Founded in 782, the present structure dates from 1619, making it one of the oldest buildings in Nikko. Futarasan Shrine is mostly free to enter and much less lavish than any of its neighbors. It’s surrounded by a cypress forest. Like Taiyu-in, it’s a nice place to escape the crowds of Toshogu and Rinno-ji. There’s a small area you pay to enter (200 yen). The area has a small garden with a few halls, a spring, and some sacred trees. Lovely… but if you’re running short on time, you can skip Futarasan without guilt. 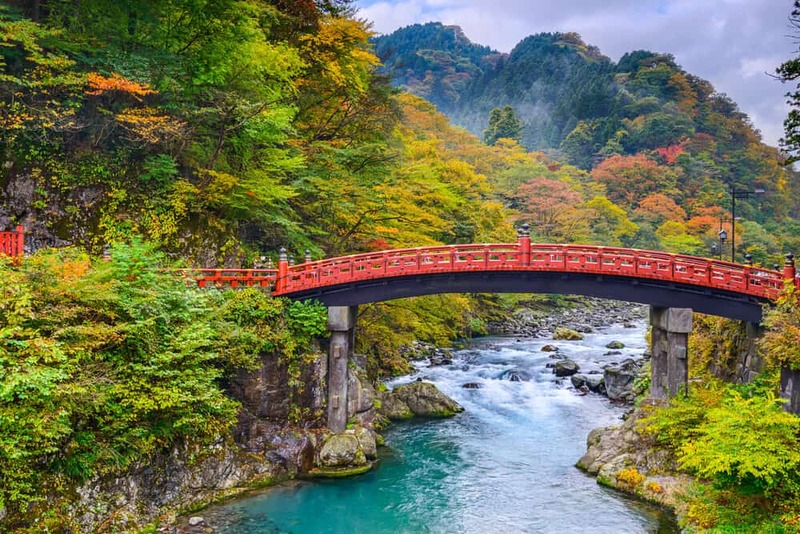 One part of Futarasan you don’t want to miss is the famous Shinkyo Bridge. It’s about a kilometer from the shrine itself. The bridge spans the Daiya River and is a beautiful shade of red. It’s one of the three most beautiful bridges in Japan. The bridge was rebuilt many times; the current bridge is modeled on one built in 1636. Back then, only the shogun could use it. Today you can cross the bridge for 500 yen. From the bridge, you get a great view of the gorge below. To get a view of the bridge itself, use the sidewalk on the nearby highway bridge. Toshogu alone is worth the trip. The temple is magnificent. The location, the level of preservation, and the history make it unique. Add in the beauty of the surrounding forest and the additional temples, and you’ll agree… a day-trip to Nikko should be on any itinerary. 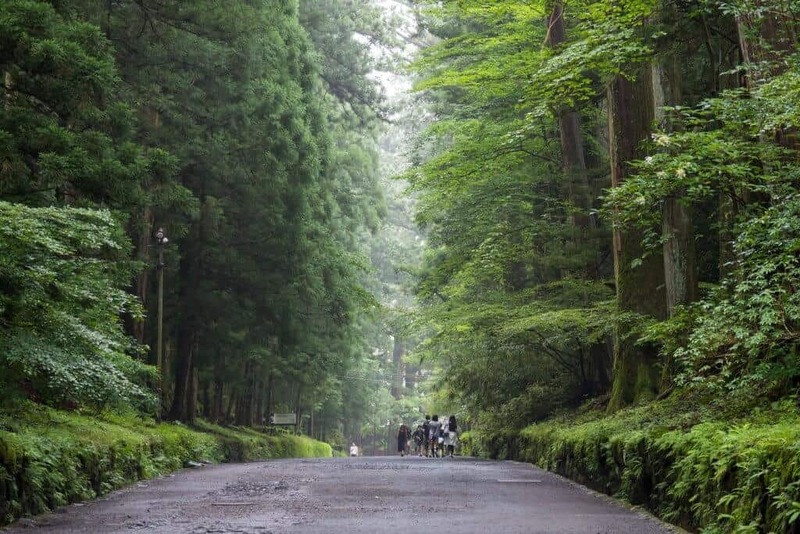 Nikko is usually explored as a day-trip from Tokyo. Frequent trains connect it to the capital. The most direct and affordable way to get to Nikko: take the Tobu Railway to Tobu-Nikko Station. The Tobu Skytree Line offers direct trains to Nikko. It takes 110 minutes and costs 2700 yen. A few limited express trains go directly to Nikko. The trip takes around 120 minutes and costs 4000 yen. The JR Lines connect with the Tobu lines at Shin-Tochigi and Shimo-Imaichi stations. Use hyperdia.com or ask station staff to help you plan your journey. The JR lines are more expensive, but if you have the JR Rail Pass then this is the way to go. 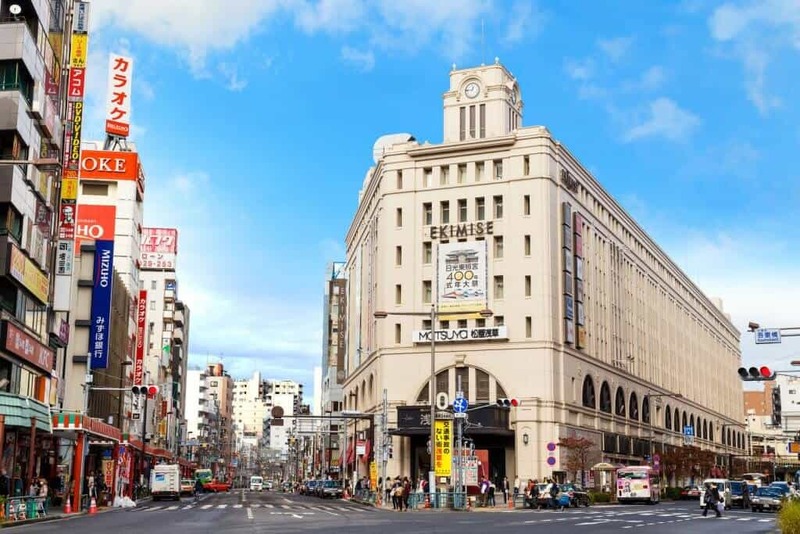 Take the Tsubasa or Yamabiko Shinkansen north to Utsunomiya Station. Transfer to the local line to Nikko. The journey takes 111 minutes. The trip is covered by the JR Rail Pass. 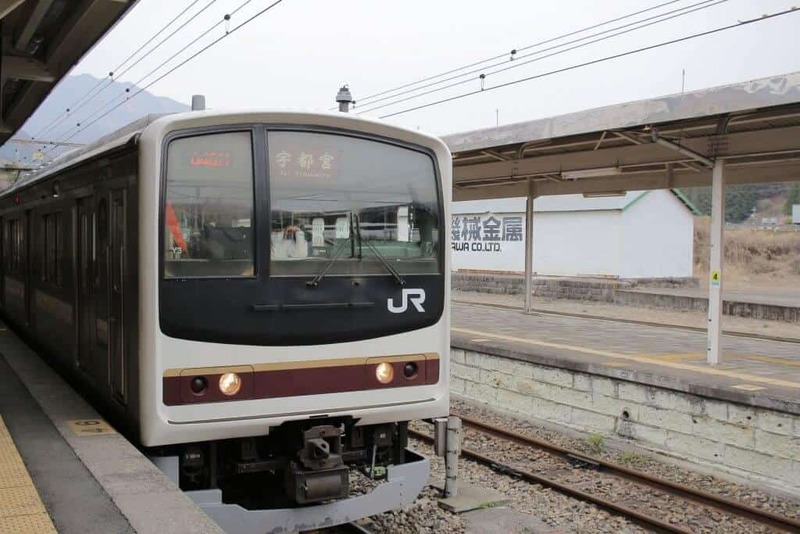 JR Lines take you to Nikko Station. 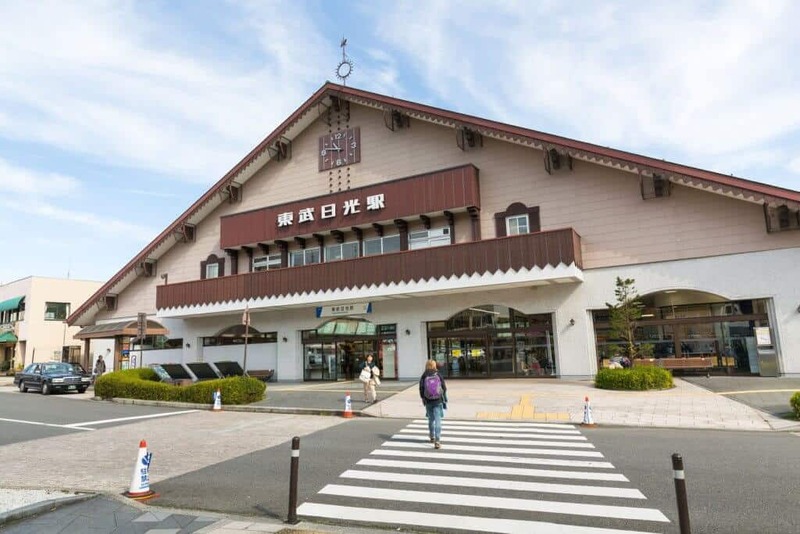 Nikko is a short walk from Tobu-Nikko Station, where you can catch a bus to the major sites. The shrines are about two kilometers from both train stations. It’s not a bad walk. Nikko is a mountain village, and free from the worst of the Japanese summer. Keep in mind you’ll do a lot of walking at the shrines. If you don’t want to walk from Nikko Station, take a bus. 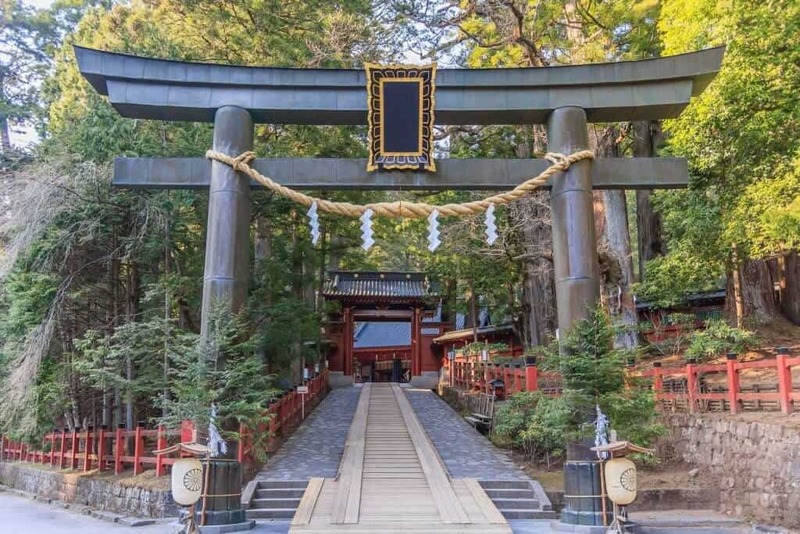 The 6-minute ride from Tobu-Nikko Station to Toshogu Shrine costs 310 yen. If you don’t have time to wait for a bus, taxi stands sit outside the JR Nikko Station. If you take the Tobu Lines, Tobu offers several discount passes. Unfortunately, the passes no longer include entrance to the shrines. 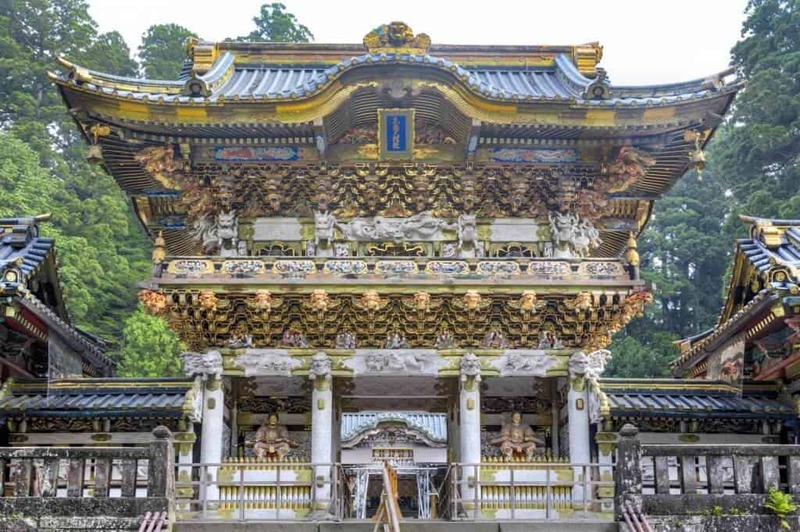 The one most likely to be of interest to day-trippers is the Nikko All Areas Pass. You get a 20% discount on a limited express ticket. This doesn’t include reservations on express trains. 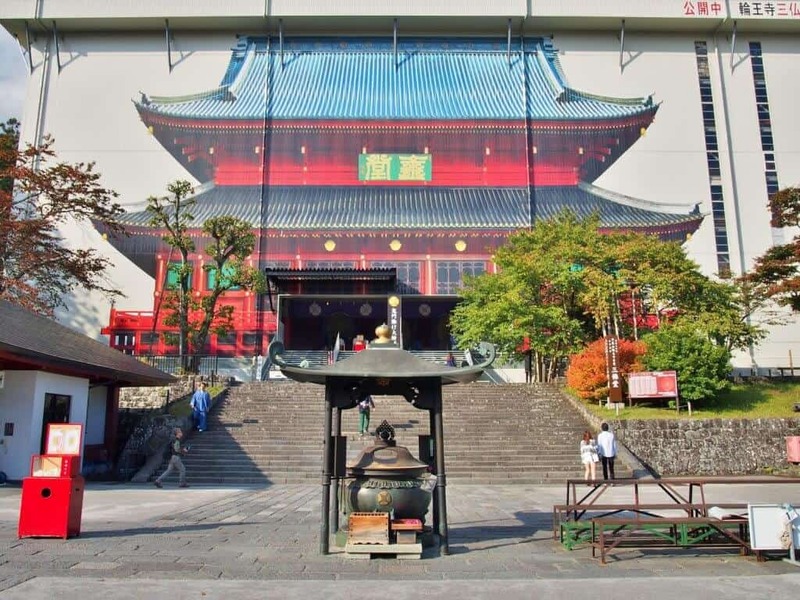 You also get discounted entry to many attractions — not including the shrines. 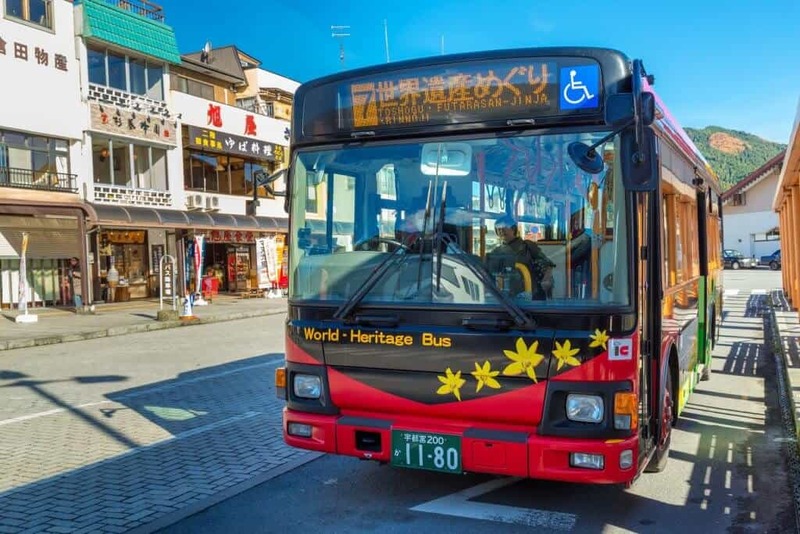 It includes rides on the 2C bus to and from Tobu-Nikko Station, and the 2A and 2B buses as far as Rengeishi. The pass is valid for two days and is most useful for people staying overnight in Nikko. Nikko makes for a great day-trip, but stay overnight and enjoy the beauty there if you have time. There are a surprising number of places to stay in Nikko, including a YHA (youth hostel). Staying the night allows you to get to Toshogu early enough to experience the shrine in all its glory. You can also explore the attractions of the mountains around Nikko. They include onsen, hiking, and wild monkeys. 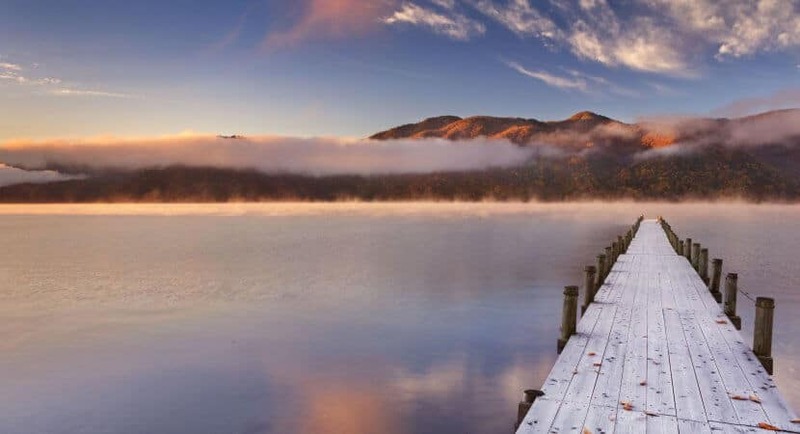 What Do You Want to See at Nikko? Would you like to see Togukawa Ieyasu’s mausoleum? Or are you more of a garden buff? What’s the coolest temple you’ve seen in Japan? How does it compare with those in Nikko? Let us know in the comments. Don’t forget to share this article with your friends… they might just need a little of Nikko’s serenity!